Oh, Life of Pi, where do I start with you? Certainly destined to be this year’s Hugo and filling 2012’s quote of big name director (Ang Lee in this case) fully embracing James Cameron’s vision of the world to create a singular 3D visual experience. It will probably win its fair share of technical awards (probably all of them) in the coming months, and I would say they are well deserved, even having only seen the 2D version. Of course, visuals are not the only story here, and can almost be a liability if the rest of the film does not hold its weight. 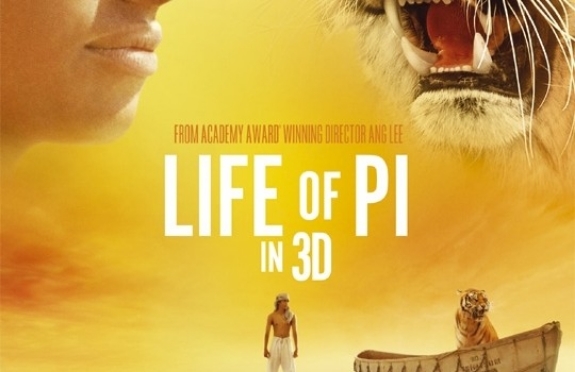 There is a pretty clear three act structure at work in Life of Pi, partially because of the bizarre choice of a framing device to introduce and conclude the film. Whether this device was lifted specifically from the book (as far as I can tell, it wasn’t, but I did not read the book prior to seeing the film) is immaterial. What matters is that this framing device, featuring Irfan Khan as the adult Pi telling his life story to a journalist, is pointless, generally uninteresting and serves as a distraction without adding anything to the proceedings. The first act begins with this framing story leading into Pi’s early life, all of which serves as a precursor to the bulk of the film that is covered by act two. Act three consists of a surprisingly baffling denouement returning to the framing device. Of course, the boat is the focus of both its marketing of the film and its content. This second act really has its own microcosmic three act structure, predominantly tracking the relationship between Pi and his tiger acquaintance Richard Parker. Considering how many exotic animals are computer generated (especially the large ones, elephants, zebras and the like), it is quite impressive how well these animals interact with each other and Pi. There are moments and camera angles that look a little off (especially with the laughing hyena), but otherwise the CG artists do a wonderful job. I am intrigued to see how the CG elements worked in mixing with the practical 3D (I didn’t see Avatar and Hugo didn’t have the same kind of special effects as this film). Nearly everything from the sinking of the ship through arriving on the shores of Mexico is exhilarating. The interaction with Richard Parker, alongside other events, including a visit to a would be paradise that turns sour, is well acted and expertly shot by Claudio Miranda. Indeed, despite some questionable voice over work (which is a problem throughout the entire film), the second act could essentially stand on its own as a very good piece of cinema. Unfortunately, the film did not end (or start, for that matter) there. The third act of Life of Pi is an extended coda designed to provide some sort of overall moral about the power of faith and survival in the face of bleak odds and mortal danger. That’s the idea, at least. What actually transpires is a return to the silly framing device, which finds no further insight over the course of the film. Further, it begins to intercut between this framing device and the actual plot of the film for the rest of the runtime (this is something that happens in act one as well, but is gratefully scaled back during the adventure on the dinghy itself). Instead of wrapping things up cleanly, we are treated to an alternate version of the events that may or may not be true, and also does not add anything to the substance of the film or the force of its moral. The entire third act is a complete narrative mess, full of awkward transitions and bad pacing as Lee attempts to tie everything into one grand unifying theory of spiritual fulfillment. All the coda manages to do is alternately confuse things further and attempt to overclarify the central message. It’s a shame, too, that the film had to begin and end the way it did considering the strength of its middle section. It could be argued that the film is still worthy, and in some ways it is, but it is difficult to recommend a film that ends on such a sour note. It’s a lot like AI in that respect. Life of Pi is a troubled film with moments of cinematic excellence that cannot quite keep itself together in the end.